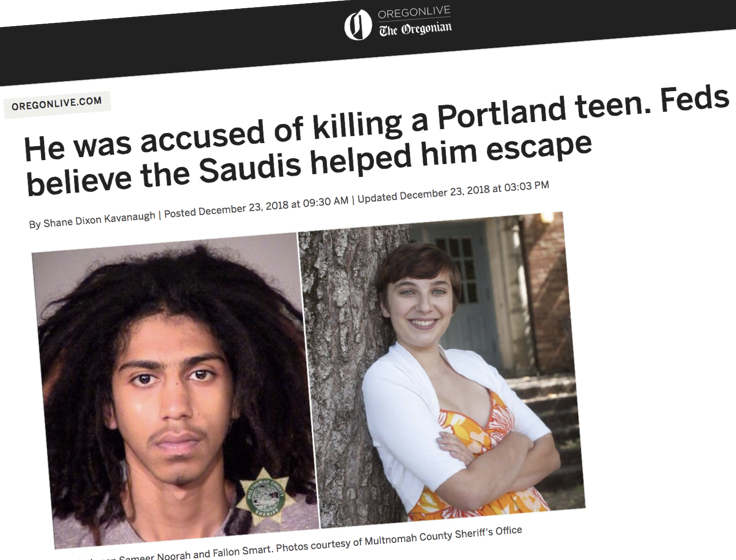 The Saudi Arabian government, Oregon’s bail laws, and a young man scared to face consequences for his actions have left the family of Fallon Smart reeling. Again. Abdulrahman Noorah is wanted by authorities. Please be on the lookout. 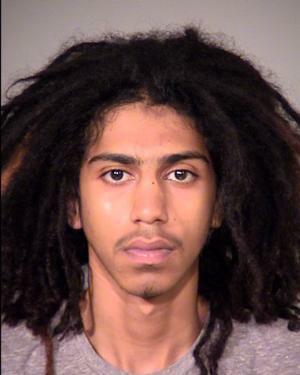 Abdulrahman Noorah, the 21 year-old man who hit Fallon Smart with his car by speeding recklessly down Southeast Hawthorne Boulevard in August 2016, is wanted by the authorities this morning after removing his GPS monitoring device. Noorah was on house arrest awaiting trial on several felony warrants. He is charged with Reckless Driving, Failure to perform duties of a driver (hit-and-run), Manslaughter in the First Degree and three counts of Reckless Endangerment. Noorah posted $100,000 bail (10 percent of the full amount) after his arrest last August and had been enlisted in the Multnomah County Sheriff Department’s Pretrial Services Program. Investigators are concerned that Noorah may be experiencing a mental health crisis as a result of the arrest and pending trial. 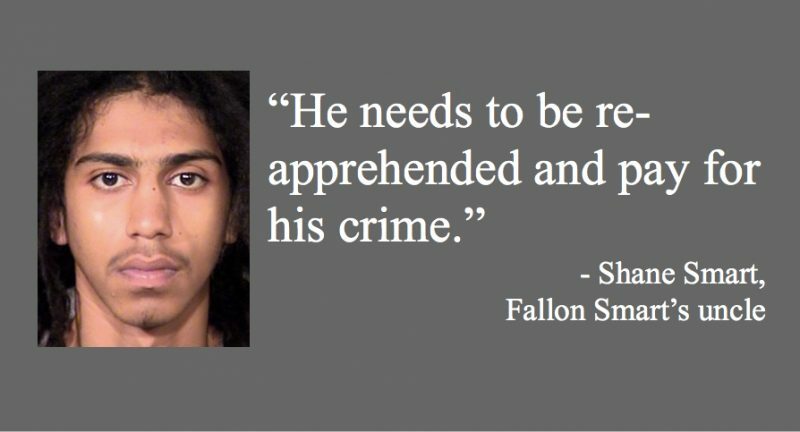 Noorah is described as a Saudi Arabian male, 6’0″ tall, and 150 pounds. His last known location was in the area of Southeast 106th Avenue and Division Street. What if this was in place on August 19th 2016 when Fallon Smart tried to cross here? As promised last fall, the Portland Bureau of Transportation has updated Southeast Hawthorne Blvd with a new painted crosswalk and median island at the intsersection of 43rd Avenue. 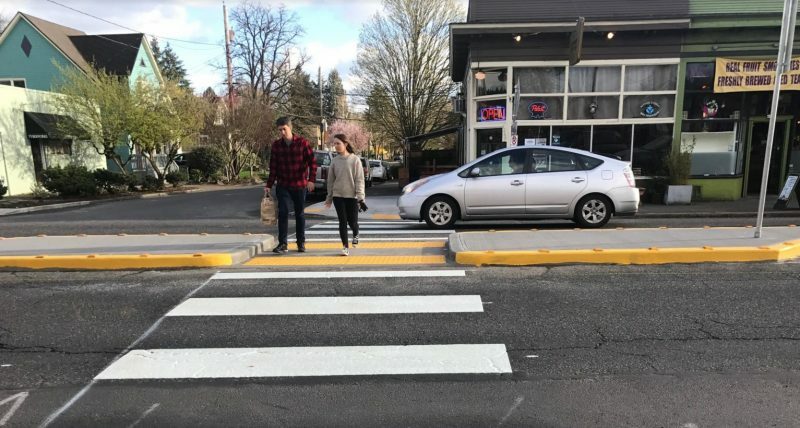 In addition to the new crossing, PBOT has received permission from the Oregon Department of Transportation to reduce the speed limit on Hawthorne between 29th and 50th to 20 miles per hour (down from 25). 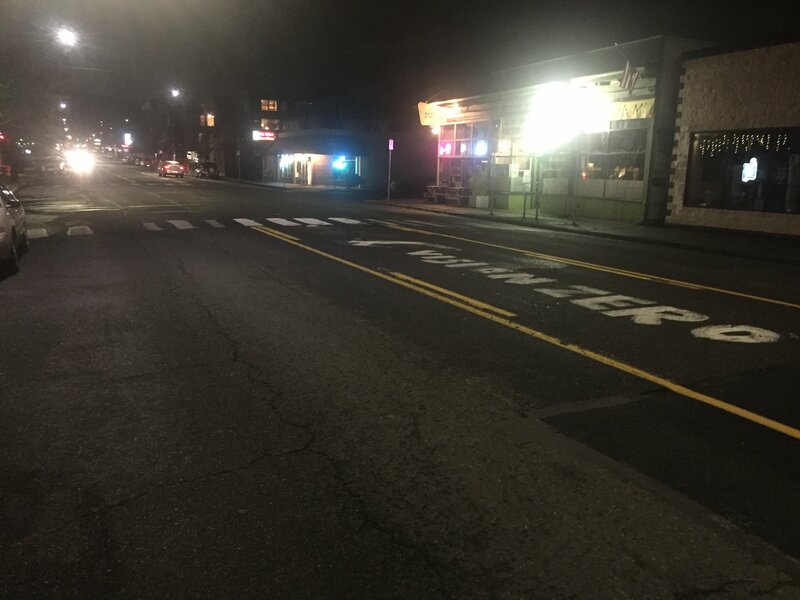 The center turn lane on Hawthorne at 43rd is now available for driving on after PBOT removed a makeshift memorial last night. 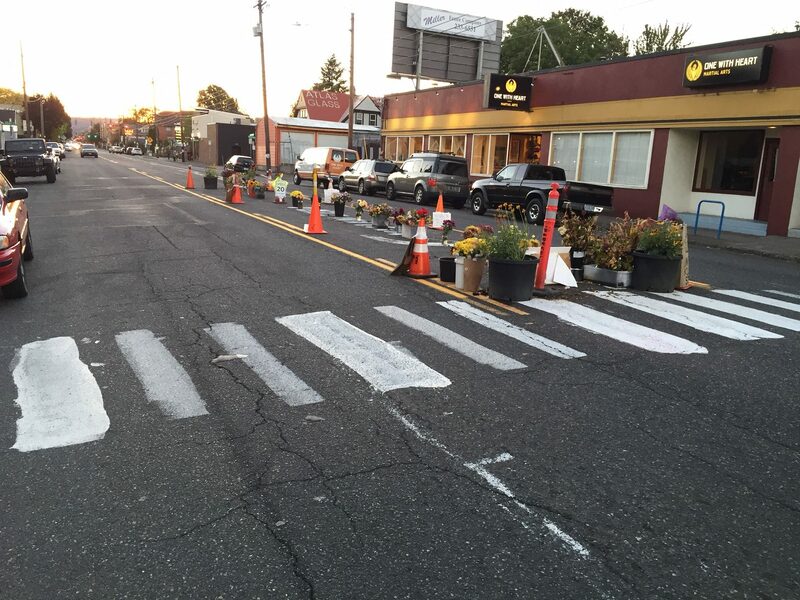 Last night under the cover of darkness City of Portland transportation bureau crews cleared out the cones, signs, candles, photos and flowers that had created a traffic calming memorial to Fallon Smart on Southeast Hawthorne Boulevard. 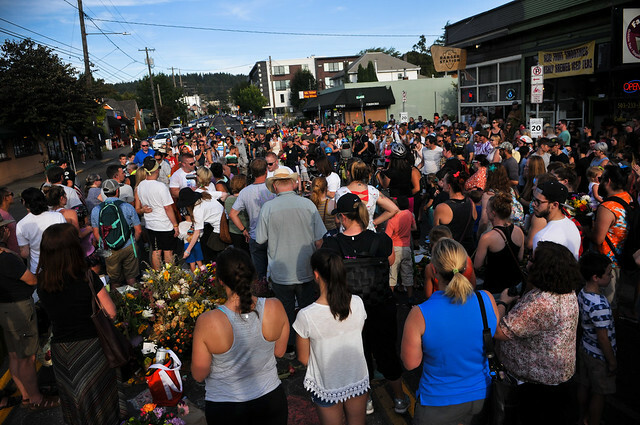 Letter to the Editor: Why won’t the City work with us on Hawthorne memorial? A man swerved around a stopped car and was speeding in this center turn lane on Hawthorne Boulevard prior to hitting Fallon Smart. 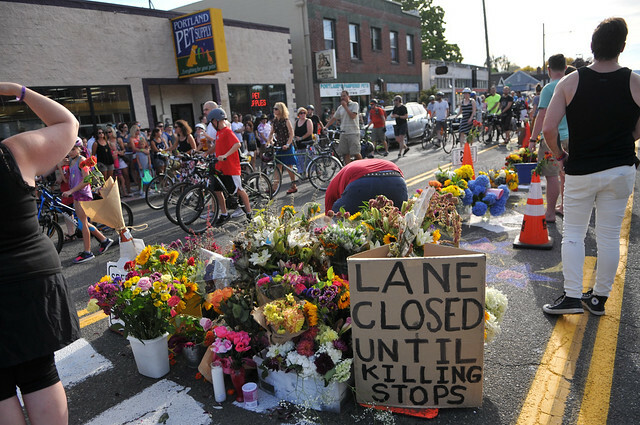 The City of Portland plans to clear out the makeshift memorial that has prohibited people from driving in the lane for the past month. This post was written by Katherine White as a letter to the community in response to news that the City of Portland plans to clear out the memorial where Fallon Smart died sometime this week. White is the program coordinator at One With Heart, a martial arts studio located adjacent to the 43rd and Hawthorne intersection. The intersection of SE Hawthorne at 43rd where Fallon Smart was killed one month ago. PBOT intends to clear this out next week. Much of the impact Fallon Smart’s death has had on our community has been emotional. It has bonded citizens and activists together. Combined with other recent tragedies, it has created a deeper sense of urgency to improve street safety — and a growing frustration at the slow pace of change — among many of us. But Smart’s death has also left something physical and tangible. Hours after the tragedy, someone painted an unsanctioned crosswalk across Hawthorne at 43rd. Along with the crosswalk, signs and traffic cones sprouted up in the center turn lane that was used recklessly by Smart’s speeding killer. Hawthorne Boulevard was open only to mourners of Fallon Smart during tonight’s memorial. The bright and beautiful girl of just 15 years died on August 19th while walking across Hawthorne Boulevard. The person who killed her was driving 55-60 mph — more than twice the posted speed limit — and swerved around a stopped car just before impact. This tragic event has shaken a large part of our community to the core. After a week of protests and visits to the scene of this tragic crime, a memorial ride returned to the site tonight. 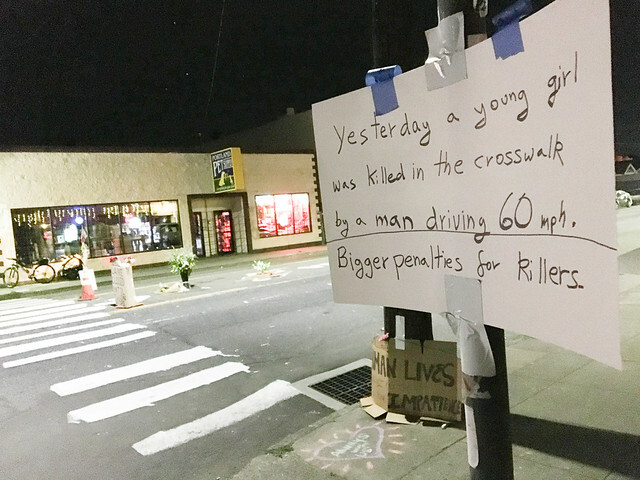 Fallon Smart’s family and friends, concerned members of our community and transportation reform activists have left their mark on the intersection at SE Hawthorne and 43rd. Whenever someone dies in a traffc collision, it has an impact on the community; but every once in a while a fatality will spark something larger. Smart’s death appears to have done that. But strangely, while citizens and grassroots activists have mobilized, there’s a deafening silence from City Hall.